Our group currently works on several projects that concentrate on fast planning and re-planning dynamically feasible trajectories for ground vehicles navigating cluttered partially-known environments that contain dynamic obstacles such as other vehicles and people. Real-time planning in dynamic environments using time-bounded lattice. ICRA'09 paper. Efficient 3D mapping of outdoor terrains. Real-time planning of dynamically feasible complex maneuvers for autonomous vehicles. IJRR'09 paper describing the planner of long complex maneuvers we have developed for Urban Challenge winner (CMU vehicle) when I was back at CMU. 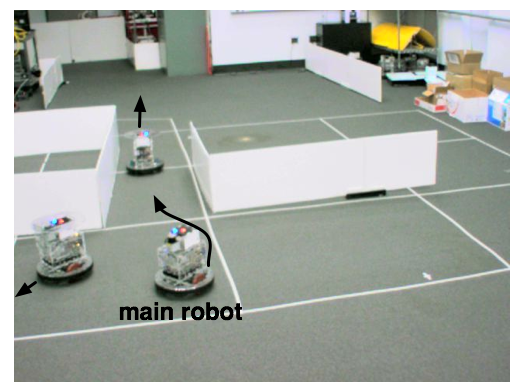 The robot uses time-bounded lattice planner to navigate amongst dynamic obstacles (other robots). movie. A segbot that my students built and now use to test motion planners for indoor and outdoor navigation. movie. ATRV navigates an unknown parking lot (project dating back to my research under S. Thrun). movies: run, map building and re-planning. Example of a planned 4D (x,y,yaw,velocity) path. Winner of the DARPA Urban Challenge '07 (CMU vehicle). Movie showing real-time motion planning and re-planning of 4D paths with Anytime D* during the race (over 100MB). PR2 navigating among people. Movie.